Book from: Library. 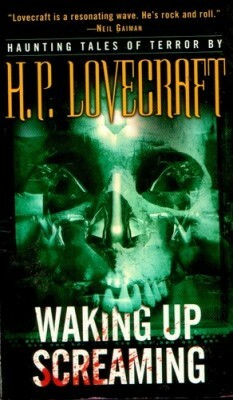 Lovecraft’s works are also available online in various archives, such as hplovecraft.com. Last Halloween I realized I hadn’t really read any Lovecraft since high school, and set out to rectify that by picking up a couple collections from the library. – and contained the following stories: Cool Air, The Hound, The Lurking Fear, The Terrible Old Man, The Unnamable, Beyond the Wall of Sleep, The Shadow Over Innsmouth, The White Ship, The Outsider, Herbert West – Reanimator, Arthur Jermyn, The Moon-Bog, The Temple, Dagon, From Beyond, and The Case of Charles Dexter Ward. “The Hound” – Lovecraft scholar S. T. Joshi suggests that Lovecraft deliberately, (self-)parodically overheated the language in this Gothickest of Gothic tales, wherein two Decadents struck by “devastating ennui” stray from Baudelaire and Huysmans, and into the accursed pages of the Necronomicon. Unsurprisingly, it’s long been one of my favorites. It’s so ripely morbid and hysteria-stricken. I also have a fondness for doggish ghouls, and the one summoned in this story is pretty kingly. Abysms!!! Dream-doom!!!!!! That Thing about the Gryphons, too, hails from these parts. “The Terrible Old Man” is a fable about the triumph of xenophobia. Hooray! It’s funny that Lovecraft attributes the same kind of thuggish, bestial degeneracy to non-WASP immigrants as he does to the ancient-monster-interbred New Englanders in “The Shadow Over Innsmouth,” and to miscegenators in general (see also “Arthur Jermyn”). One imagines his ideal man as a skinny white fellow valiantly sandwiched between the forces of ancient evil and the rising, filthy tide of new immigrants. The taste of his neuroses – the smell of sheer fearfulness – is frequently almost overwhelming. Of course, matters pan out such that the skeptical friend, too, is forced into a sense of cosmic and epistemological abjection. A lot of my thinking about life, the universe, and everything Unnamable has, in fact, been flavored by Lovecraftian cosmicism in the past few years – mostly instigated by Caitlín Kiernan‘s science fiction – so I was inclined to offer plauditory fingersnaps at the end of it. Finally, a review of stuff that I’ve read! I’d class “Herbert West” and “The Lurking Fear” as hackwork; stories like “The Moon Bog”, From Beyond” and “The Terrible Old Man” are minor efforts in which Lovecraft was still honing his skills. “The Shadow over Innsmouth” is the best story in this collection; it’s one of his most shudder-worthy stories, and is almost the only time that Lovecraft writes an action sequence. It also has one of the most explicit affirmations of H.P.’s race prejudice(outside of his letters, which I’d urge everyone to read). In his biography of Lovecraft, L. Sprague De Camp said that Lovecraft had abandoned his ethnic prejudices by 1935. S.T. Joshi says that Lovecraft remained a committed racist to the end of his life, but the examples of racism he cites are all from before 1935. De Camp does quote from a late letter in which Lovecraft repudiated anti-Semitism(Cf. Lovecraft: A Biography). I love love LOVED how picturesquely pulpy “Herbert West” was. And when it comes to “The Moon Bog,” I seem to have a persistent partiality towards tales of Things Best Left Undisturbed in Celtic or Roman British settings – John Buchan’s “The Wind in the Portico” comes to mind. But “Shadow” was certainly the most seriously chilling of the stories in the collection, as you say – though I was very stirred by certain runs of “Charles Dexter Ward,” too. Thanks for the intriguing cites about Lovecraft’s racism – I’m eager to have a look at the De Camp biography now. I barely remembered “Herbert West”, so I gave it another read. It is kind of cool in a way–I think “languid Elagabulus of the tombs” may be the deliciously silly line Lovecraft ever wrote. Typo; I meant to write “most deliciously silly line”.